This exotic postal card has two nice date stamps. It was destined for a local delivery. The card is printed on a bright yellow card stock. The card is a 1 Att* of the 1883 issue. 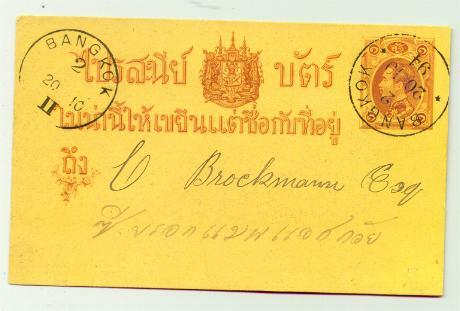 The impression is derived from the 1883 stamp showing King Chulalongkorn. * Thanks to Quokka999 (Paul) for this addition. 32 Solot = 16 Atts = 4 Slk = 2 Fuang = 1 Salung.